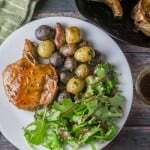 Maple Glazed Pork Chops – perfectly browned pork chops are smothered in a finger-licking-good maple glaze. Make this 30 minute recipe for dinner tonight! So I decided to make another quick and easy pork chops recipe – Maple Glazed Pork Chops. You guys!! This turned out so good. This maple glaze is total perfection. It is perfectly sticky and sweet, yet aromatic and herbal, thanks to the wonderful combination of maple syrup and thyme. In other words, it is totally irresistible and addicting, and you will find yourself licking the spatula and everything this sauce comes into contact with. You can use bone-in or boneless pork chops for this recipe. Use real maple syrup! Do not use caramel-colored high fructose ”pancake syrup” that tries to disguise itself in the syrup aisle. The flavor will not be the same. This one from Amazon is a pretty good deal! The sauce will thicken as it cools, so stop cooking it down when it looks just a little too liquid for your taste. Otherwise you will end up with a thick honey-like consistency. Which is not a bad thing! It will just be harder to pour over the pork chops. You can actually use fresh or dried thyme for this recipe. Thyme is one of those herbs that is pretty good dried and still keeps its flavor. This one from Amazon is pretty good! Hungry for more quick and delicious pork chop recipes? Easy Pineapple Pork Chops. Get the recipe here. 30 Minute Cajun Pork Chops. Get the recipe here. 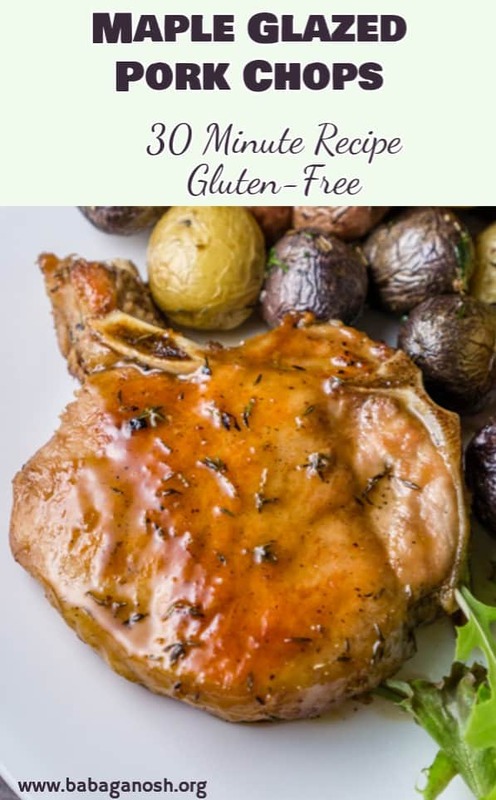 Maple Glazed Pork Chops - perfectly browned pork chops are smothered in a finger-licking-good maple glaze. Make this 30 minute recipe for dinner tonight! Season both sides of the pork chops with salt and pepper. Heat 2 tablespoons of olive oil in a large skillet, and cook the pork chops over high heat for about 5 minutes on each side, or until both sides are nicely browned. Remove the pork chops from the pan (place them on a large plate) and reduce the heat to medium. Add the remaining olive oil, minced garlic, and thyme to pan and cook for 1 minute, or until the garlic is golden. Add the rest of the ingredients (maple syrup, dry white wine, chicken broth) and give it a stir. Carefully place the pork chops back into the pan and continue to cook for about 15 minutes, or until the sauce has thickened to a nice glaze and the pork chops are fully cooked to an internal temperature of 160F. Remove from heat and serve hot, spooning the extra glaze from the pan over the pork chops. Cooking time of pork chops will depend on their thickness. 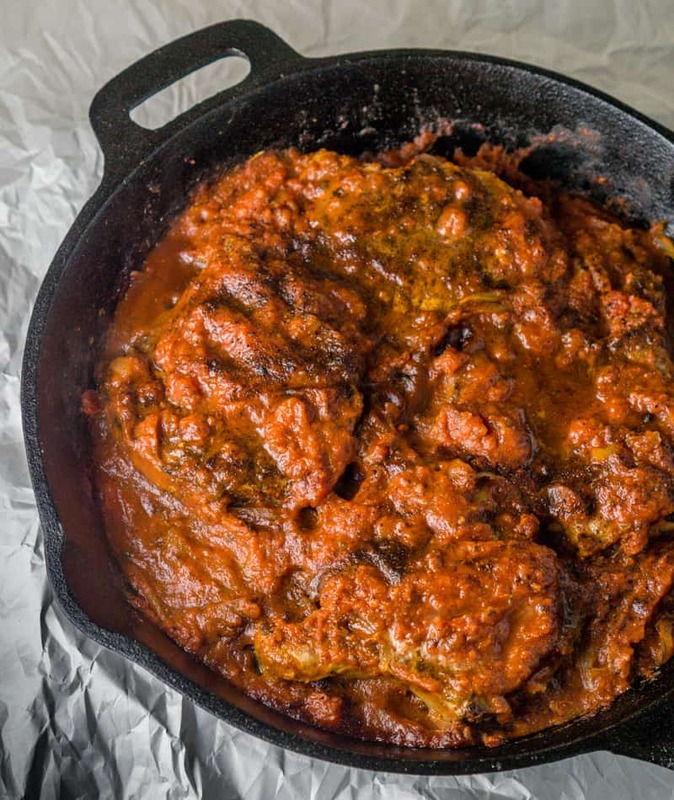 If the pork chops are fully cooked before the sauce has thickened to your liking, remove them from pan and cook down the sauce for a few minutes. On the other hand, if your sauce cooked down too much and has started caramelizing but the pork chops are not done, add in a 1/2 cup of water or chicken broth and stir. Thank you for another fantastic recipe, you guys have an amazing weekend! Aunt Jemima isn’t actual maple syrup, it’s corn syrup with caramel color to make it look like the natural maple syrup from a maple tree. And while that stuff can be delicious, the flavor is totally different. It’s sort of like using honey versus sugar. Sugar is good, but honey will give your food or drink a different flavor. If you don’t have maple syrup in Greece, you can try making this with any other syrup – as long as you get a sticky sweet sauce, it should still be delicious! Again, thank you for the yummy recipe and for the maple syrup info! Much appreciated! These Pork Chops look scrumptious, Kate!!! I just need to buy some maple syrup, and I am cooking these!!! Your photographs are beautiful!!! These pork chops are calling my name! I LOVE the maple glaze! Definitely going to make these for our family for dinner!